We are proud to be the official suppliers for all marquee hanging lanterns installations by The Hanging Lantern Company in Scotland. We love the massive transformation these make to any venue space. Marquee Hanging Lanterns – huge wedding trend! 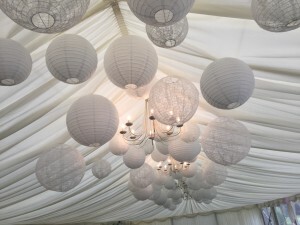 We have seen a lot of enquiries and bookings for marquee hanging lanterns in the last 6 months – it is certainly on trend for weddings currently! Well, thanks to our fab suppliers, we have the whole spectrum on offer. We have set up marquee hanging lanterns with just white lanterns, white and white lace lanterns for a simple, elegant look. We have done pastel tones – some of our favourite have been pastel pinks, dove grey and ivory. But we have also done BOLD installations with red, yellow, orange, turquoise, green and purple all featuring together – a multi coloured set of marquee hanging lanterns for a fresh and bright summer wedding! 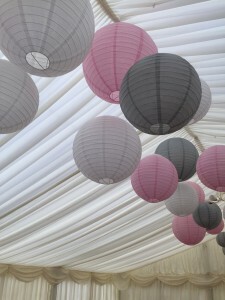 We can also offer marquee hanging lanterns with lights inside – illuminated lanterns. Sometimes we light half and half, or we can light them all – just enquire for this price. Our hanging lanterns also look fab when mixed with our fairy lights or our festoon lights and these can be added into your canopy to get the ultimate wow factor! For more information on marquee hanging lanterns please visit our website/lighting page. For more pictures of our marquee hanging lanterns please visit our Facebook page where there are lots of examples, which we regularly update!